Gross. It targets Day cards, of which there aren't a ton seeing play in the first place, plus it can't target triggered abilities from cards already in play (unless I'm misreading the card or it has errata). I think you're able to hit the "destroy all Night cards" effect with this, which is marginally useful as protection for your Night cards, but you're probably just better off running more copies of the relevant cards instead of this. 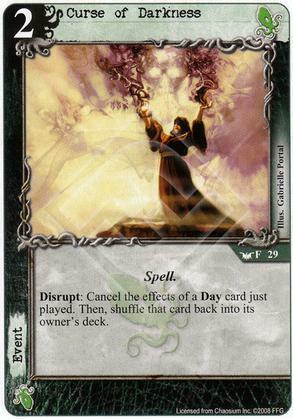 I'm not sure how many day cards have a comes into play effect, beyond destroying all night cards (which you can prevent)? Have to agree with the comments above. This is to stop all of your night cards from being destroyed. Most decks don't go too heavily into night/day because of the risk of meeting an opposing deck, this mitigates that risk and allows you to experiment more.